Chiropractic manipulation and mobilization can deliver fast relief as well as great treatment results. In this article, we will list a few of the benefits that a professional chiropractor can offer. Here at Preston, we are right around the corner. With qualified and VERY experienced medical professionals to examine and treat your particular situation, you’re literally in good hands here at Preston Chiropractic and Acupuncture in Cary NC. Many parents seek the help of a trained chiropractor for their children due to incidents of childhood disease. Many times parents come to realize that chiropractic care is not only produces great results, but is also cost effective without having to give up quality. Chiropractic manipulation and adjustments don’t require surgery or drugs and are mild. Also, chiropractor services can be used to treat illnesses that involve musculoskeletal systems and the nervous system. Spinal manipulative therapies provided by chiropractic medicine has been successful in the treatment of medical conditions for children in all age ranges. These are just a few of the services we offer. For any of your Apex chiropractic needs,give our offices a call. We have some of the best chiropractors in Apex and surrounding areas. Distance should not be an option when it comes to health. Whether you were involved in an auto accident or are working hard at your cubicle, we are dedicated to help you advance in life with great posture. There are many people that experience serious sleep disorders and headaches, and chiropractic medicine such as spinal manipulations have been used to successfully treat them. A spinal manipulation aids to get back the natural mechanical alignment of the spine, because when it’s out of whack, it damages nerve flow. Additional conditions that can respond favorably to chiropractic treatment include allergy symptoms, ADHD or Attention Deficit Hyperactivity Disorder, and asthma symptoms. Chiropractors can deal with many more problems than are listed here. Most issues can be dealt with immediately with a qualified chiropractor, or at least the patient can find relief for a short time. However, if you find that you don’t have any problems, you may want to still visit a qualified chiropractor so that you can prevent issues from happening later on. Ranked in the Top Ten places to live in the United States by Money Magazine, Apex, NC, can still retain its small town feel while still providing an upbeat historic downtown area. Preston Chiropractic & Acupuncture is only 4.1 Miles from Downtown Apex, which hosts a variety of successful small businesses like My Girlfriend’s Closet. 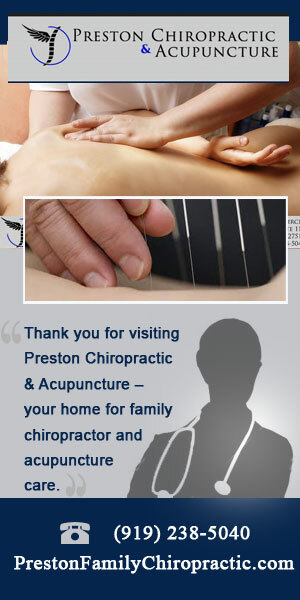 Preston Chiropractic & Acupuncture has assisted many Apexians with neck and back pain, acupuncture needs, and nutritional counseling over the past 10 years.